When I was considering what exactly it was that I wanted to feature today, putting together just about anything drenched in pure green seemed so very expected. 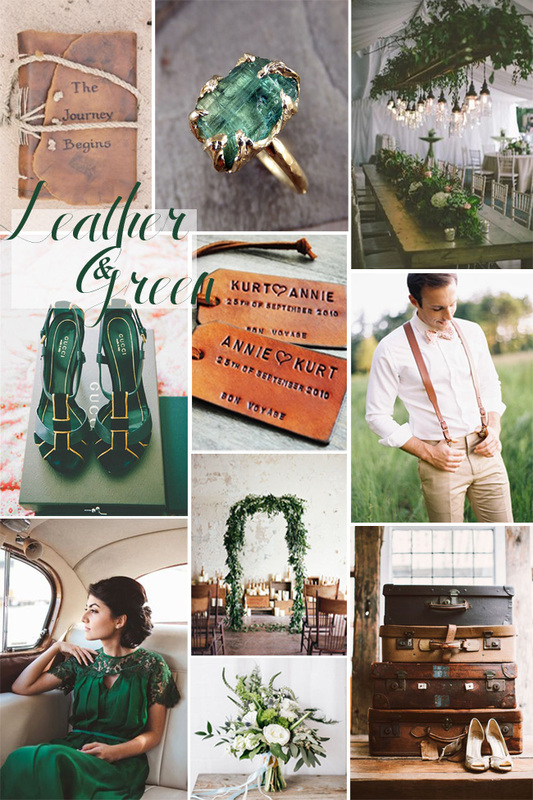 After a few moments of mauling spring weddings over, it occurred to me what pairs ever so beautifully with the deep earthy hues of green, leather. Both green & leather has a true organic life force feel, when the two are paired together there is a real salt of the earth power that is hard to ignore. Working mostly with jewel tones of green, those found naturally occurring, nothing to bold or extreme, there is a certain passive feel that emotes, a calm & cozy place. Each element has a feel of refinement & sophistication, all while being grounded and wholesome. This spring wedding inspiration board serves as the perfect bridge for couples looking for style & grace all while assembling a day that is filled with personality & charm.